This is the first English translation of one of the most revered and often-used tantric texts in Tibetan Buddhism - the Manjusri-nama-samgiti. While consisting of only 160 verses and some mantra sentences, the work condenses an enormous tantric lore, so much that it garnered exalted mention in the Vimalaprabha - the great commentary on the Kalacakra - and is cited a number of times in the celebrated tantrist Naropa's Hevajratantra commentary. 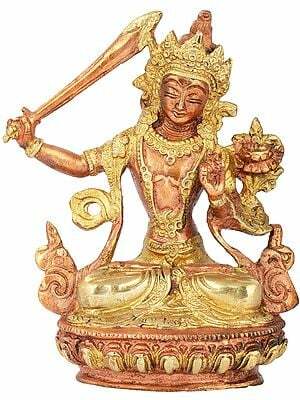 Chanting the Names of Manjusri sets the English translation of this important text alongside the complete original Sanskrit, with its Tibetan translation. The format of presenting the three translations side-by-side, along with pertinent extracts from the Tanjur commentaries on the work, creates an ideal situation for study. Alex Wayman became Professor of Sanskrit at Columbia University in 1967 and has the title Professor Emeritus of Sanskrit, effective July 1991. among his awards are the honorary D. Litt. At Nalanda University, India (April, 1978); and a work in his honor Researches in Indian and Buddhist Philosophy (Delhi, 1993). 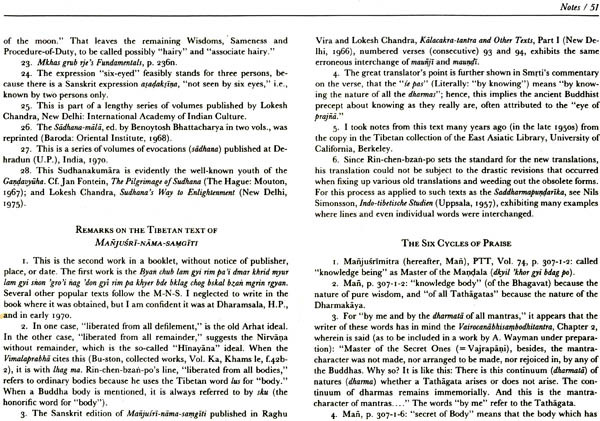 His main contribution to Sanskrit per se is his translation of the Visvalocana lexicon (published in Japan, 1994). Otherwise, his publications have been in non-Tantric and Tantric Buddhism, using the Sanskrit and Tibetan languages, with a stream of books and articles now over a hundred and fifty, and which steadily increase. Now he is busy completing a two-volume treatise on Buddhist Logic, on which he had worked as time allowed for many years; and is continuing to write essays on important topics of Indian lore. 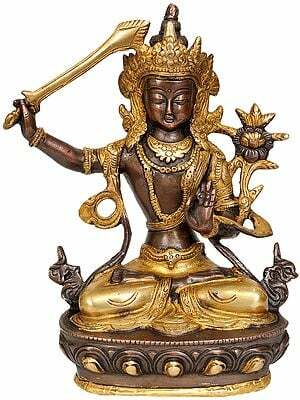 As I mentioned in the introduction in spring 1970 while in Dharamsala north India, the learned Lama Geshe Rubten had recommended that I meditate on Manjusri later, Geshe Rabten and his disciple Gonsar Rinpoche established a Tibetan center in Switzerland. The more obvious manner in which I carried out that Lama’s recommendation was in preparing this work chanting the names of Manjusri. Less obvious is the Tibetan tradition of the Gelugapa sect, founded by Tsong-kha-pa that this founder is the incarnation of manjusri. The present writer spent many years studying and translating works by Tsong-kha-pa. I put out the last part of the lam rim chen mo under the title calming the mind and discerning the real which was published by Columbia University in the U.S.A. and later by Motilal Banarsidass in India later published my translation of the Bodhisattva section of that same Tibetan work I prepared my rendition of this author’s work on Buddhist logic as the last work in my A Millennium of Buddhist logic Vol. one in my works on Buddhist Tantra, occasionally I have cited Tsong-kha-pa tantric survey called snags rim chem. Mo since I transcribed every single quotation of this work on individual sheets kept in notebook. That shows that I indeed followed Geshe Rabten’s meditation advice and I am pleased to have an Indian edition of chanting the names of Majusri issued by Motilal Banarsidass. 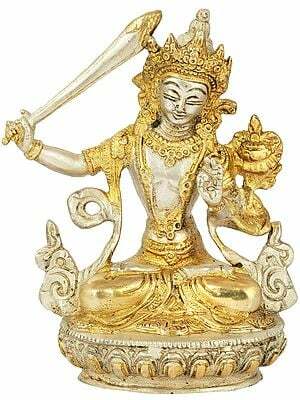 Upon presenting this remarkable work, to be called "Chanting the Names of Manjusri," the present writer should explain the origin of this project and what the final result amounts to. In spring of the year 1970, at Dharamsala, H. P., India, I had the good fortune to meet and consult with Geshe Rabten and his disciple Gonsar Rinpoche, who in recent years have been in Switzerland. 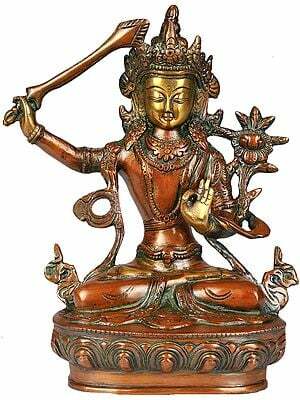 The learned Geshe told me I should meditate on Manjusri. I was indeed impressed with this advice, but my nonritual devotion is in taking pains to solve problems, both in the language of a text and in its associated ideas. During my tantric studies, resulting in several published works I long ago learned about the importance of the Manjusri-nama-samgiti to all Tibetan sects. My own library has the Peking Sanskrit-Tibetan blockprint of this text, originally procured in Peking by my teacher F.D. Lessing, as well as a copy of P. Minaeff's Sanskrit edition, St. Petersburg, 1885. Some of my published articles utilize the Smrti commentary in its Tibetan version. 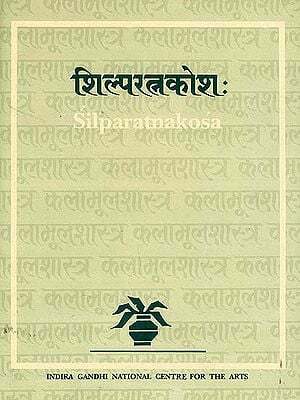 Conceiving the plan of a volume of "minor" tantric texts, including the Majnusri-nama-samgiti, I made draft translations of this and some other texts that had commentaries to aid the project. This plan was interrupted by other projects in recent years. In 1982 I decided that such important texts (whether or not called "minor" by length) should not remain in manuscript and set to work first on the Manjusri, but then found the supporting material so multiplying that a separate work was indicated. My library has long had duplicates of two Yogatantra commentaries on the Manjusri from the Tibetan Tanjur-those by Candrabhadrakirti and by Smrti. In order to balance these, I obtained the commentary by Narendrakirti in the Kalacakra section of the Tanjur. It turned out that Narendrakirti wrote the most intellectual commentary, Smrti the most learned, and Candrabhadrakirti the most intuitive and speculative. For reasons only partially clear to me, these commentaries proved individually superior for certain chapters of the text. While these commentaries sufficed, for a few places I consulted some other commentaries, both in the Yogatantra and the Kalacakra sections of the Tanjur. The commentaries furnished extra meanings, sometimes fascinating, for this and that; and also clarified the structure of the text, but did not reveal why this text was so popular, indeed, why their authors were moved to write commentaries. To explain this paramount role of the Majnusri-nama-samgiti, I have prepared several introductory chapters. In Chapter 1, on background, I attempt to trace Manjusri's emergence from obscurity in early centuries A.D. to an identification with Prajnaparamita (Perfection of Insight or of Wisdom), Chapter 2, on the citations in Naro-pa's commentary on the Hevajratantra, has all fifty-three of his quotations of the Manjusri in the order of the Hevajratantra chapters. 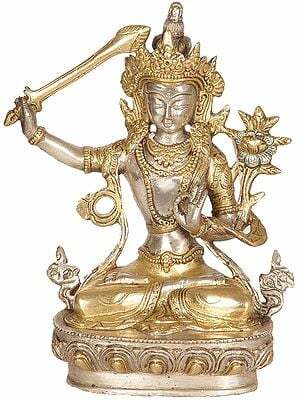 This shows the importance of the Manjusri-in the cult that uses both the Kalacakratantra and the Hevajratantra. 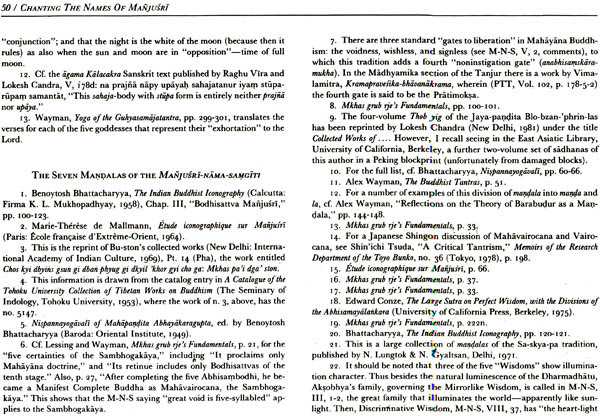 Chapter 3 on the seven mandalas of the Manjusri-nama-samgita, associates chapters of this text with cults of Manjusri by way of iconographical forms, of which a full list is furnished from Jaya Pandita. In chapter 4, remarks on the Tibetan text, I set forth the makeup of the Sanskrit text and its brilliant Tibetan translation by Rin-chen-bzan-po, considerations, which bring out the meaning of Manjusri's "names" and also affect the translation into English. Chapter 5 on "the six cycles of praise" presents a translation of the prose insertion of some Manjusri-nama-samgiti editions. These six paragraphs extol the recitation of the Majnusri and contemplation of the deity Manjusri, and so help the reader into a frame of mind agreeable with the text and translation of the Majnusri-nama-samgiti that immediately follow. Certain scholarly aids are appended: an index of the Sanskrit first padas (metrical feet), an index of Tibetan first lines (of the four-lined verses), along with an index to the translation and its notes by chapter and verse. 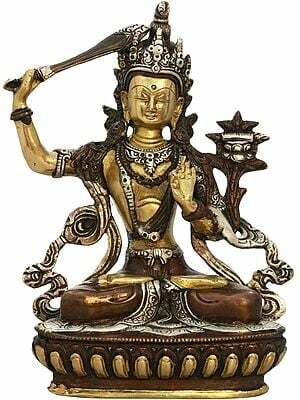 The not inconsiderable labor to present this text in the proper light is the way I have meditated on Manjusri.